In the late 1950s, many people took it for granted that our skies would be filled with thousands of amazing flying machines by the year 2000. But this posed a design challenge for futurist-minded planners. Where would these flying cars and helicopters land in the cities of tomorrow? In 1957, a handful of designers in London came up with a solution: the Skyport One. Much like the plans for Motopia in 1960, the Skyport One wasn't just some random excuse to play with futuristic ideas. The designers had an ulterior motive in that this airport concept was supposed to help sell glass as the building material of the future. Working for the Glass Age Development Committee, designer James Dartford imagined three platforms towering 500 feet above a commercial building in London. His scale-model design appears in the photograph above, complete with a helicopter-bus drawn in for good measure. The Glass Age Development Committee was originally established in the 1930s by the British company Pilkington to promote the use of glass. After World War II, the company really kicked into high gear with bold, attention-grabbing plans. The committee of designers and architects built futuristic models for buildings and new cities in England — all utilizing plenty of glass, of course. As David Jeremiah notes in the book Architecture and Design For the Family in Britain, 1900-1970, the mission of the committee wasn't just to make the designs look futuristic, though every design brief specifically called out the year 2000 — they were also supposed to be realistic. Every design concept was required to use technologies that were readily available in the 1950s, which helped inject a sense of urgency into each futuristic proposal. "We could start building this tomorrow..." was a common sentiment expressed in the press. The committee certainly got the worldwide attention they were after, with the photograph above running in dozens of American newspapers during 1957. This is Skyport One, a sketch of an airport conceived by James Dartford for the Glass Age Development Committee. Although designed for the London of 2000 A.D., its designer believes it could be built today. It would be located in St. George's Circus, not far from Waterloo Station and would be 500 feet tall. Planes and heli-buses would use the platform atop the three tall, glass-enclosed elevator shafts through which passengers and crew members would be carried from street level. Other features would be a sky-top restaurant with a far-reaching view of the city. The building below would house offices, hotels and garages. Designs like these were clearly an influence on the 1962-63 version of "The Jetsons" that would in many ways parody the Googie aesthetic of midcentury futurism. 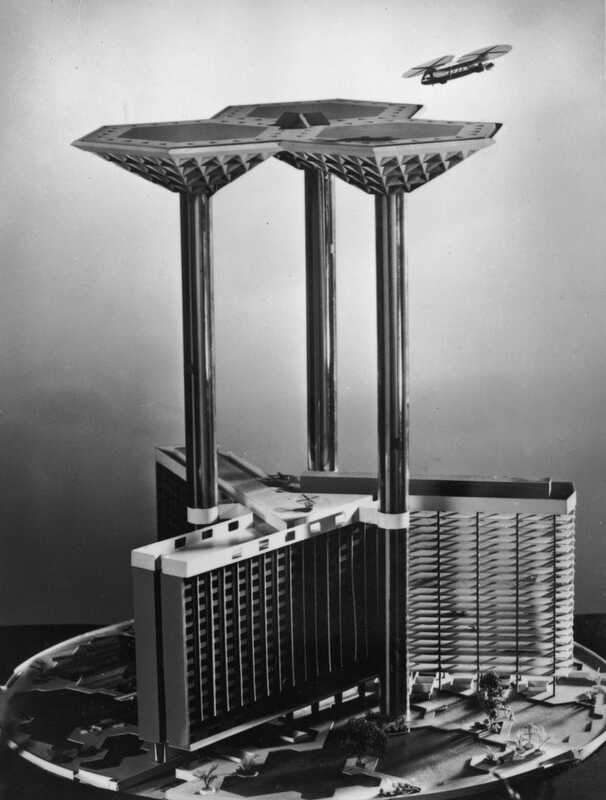 But there was nothing insincere or comic about the Glass Age Development Comittee's proposals for the Skyport One. The flying car was coming, whether we liked it or not. So we better be prepared... with plenty of glass.